Disclaimer Notice: I’ve received products/compensation as part of the Graphic 45 Design Team. This project however, is 100% my own project! Some of the links in this post are affiliate links. I explain more HERE!. . 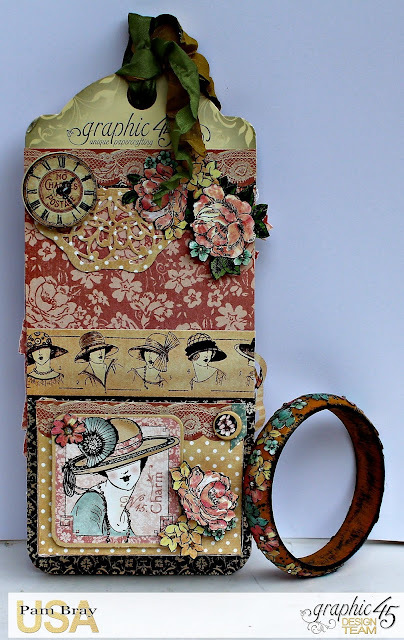 Today I am sharing my A Ladies' Diary Creative Tag I made using one of Graphic 45 package back and Graphic 45 A Ladies' Diary Deluxe Collection. 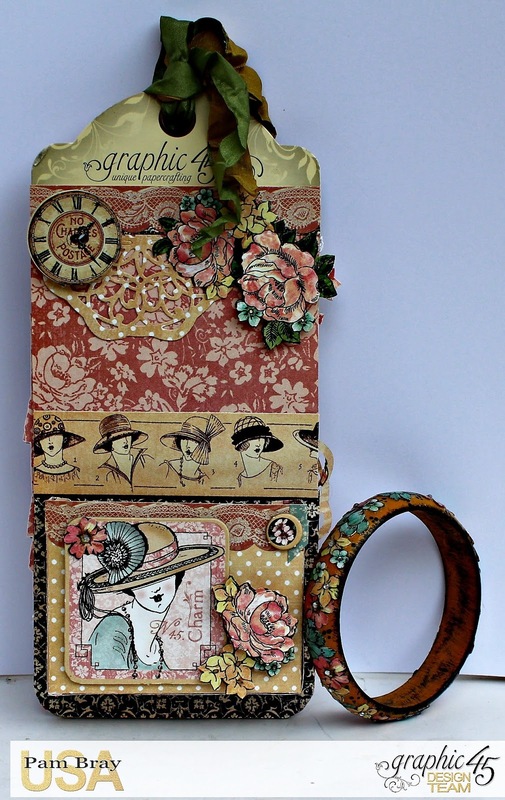 I began by covering my tag with some of the pretty pattern paper from the collection. Add a bit of tatted ribbon; staple it into place. Corner punch the bottom of the tag so the paper will match up. Die cut a doily from the A Ladies' Diary pattern paper. Add image to top of tag; fussy cut like image from second paper. Add to top with pop dots. Add to tag with pop dots. Add a few clear gemstones. Add chipboard tag to top of tag. Place "MOM" sticker to top. Add more fussy cut flowers to bottom of tag with pop dots. Turn over adhere pattern paper to back of tag. Add wrinkle ribbon to top; along with doily die cut. Fussy cut flowers; add to tag with pop dots. Add sticker clock image to tag with pop dots. Paint bracelet with Yellow Oxide Paint. Fussy cut lots of small flowers from pattern paper. 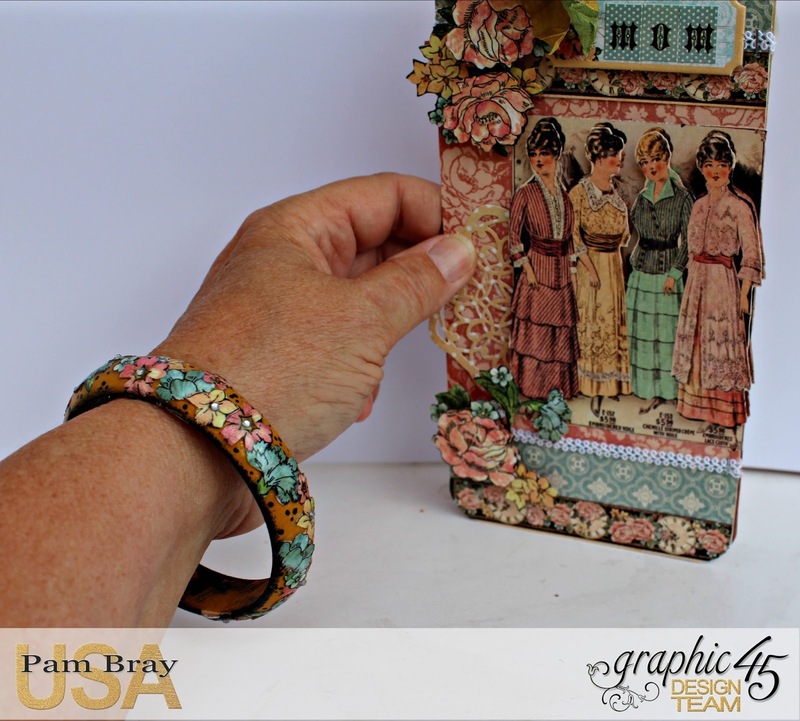 Add small flowers to bracelet with Decou-page; dry. Paint edges with Carbon Black; dry. Add sticker border strip to top of box. Adhere prepared box to back of tag. Adhere chipboard to top of box along with fussy cut flowers using pop dots. Place prepared bracelet into box on back of tag. I hope you have are inspired by my Mother's Day inspired A Ladies' Diary Tag and Bracelet!! !